Mother's Day WEEK SPECIAL... 50% OFF EVERYTHING in Fifi Flowers' shop... MUST use the DISCOUNT CODE: MOM50 sale expires May 13th @ NOON California time. Fifi, I love these bicycle pieces. You are just so full of fun and whimsy and I love it. I cannot help but think that you should find some way to enlarge your images, even if they are blown-up copies, sign & # them...I, for one, would love the larger works and I would have them hanging in a splendid grouping...just for Fifi !! Love you !! What a great special on your amazing work! Hope you are well Fifi! 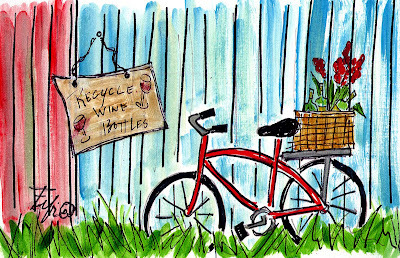 LOVE these cute paintings...."recycle wine bottles", what a fun touch! 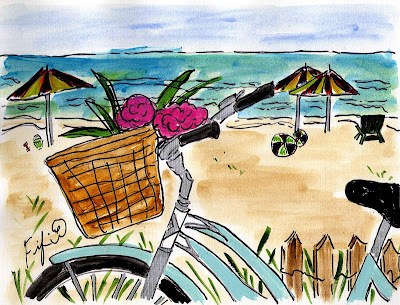 I love the bikes, too...and ordered some of the cards this morning! happy Mother's day to me! Happy Mother's Day. It would be wonderful to be a part of Seasonal Sundays. You might be interested in my $100.00 Give Away. These are TOTALLY delightful! Happy Pink Mother's Day!